Hi – had some fun at Friday night’s Fun With Glossy Cardstock making these cards using the Polished Stone technique. Place 2-3 drops of Calypso Coral ink on the cotton ball. Place 2-3 drops of Lemon-Lime Twist on the cotton ball. 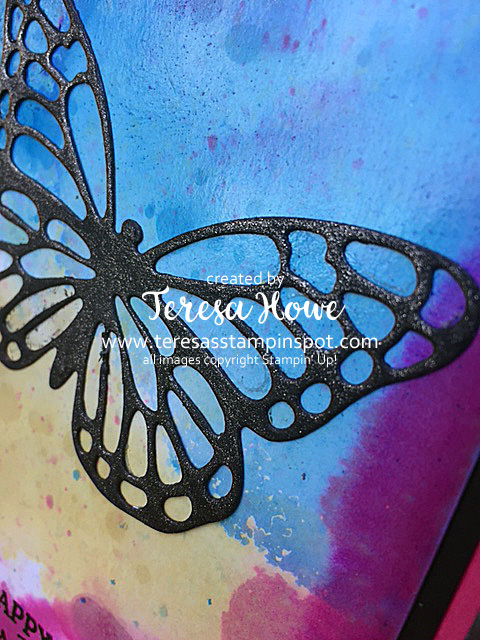 Once you have the coverage you like, use the Heat Tool to re-heat the stamped image and watch the image pop out of the color (basically you are evaporating the rubbing alcohol and ink from the embossed image). If your image doesn’t really stand out – apply more ink to the cotton ball and re-apply to the Glossy Cardstock. The fun thing with this technique – it can be vibrant or muted – depending on the amount of ink used. I hope you enjoyed today’s cards! Hi! 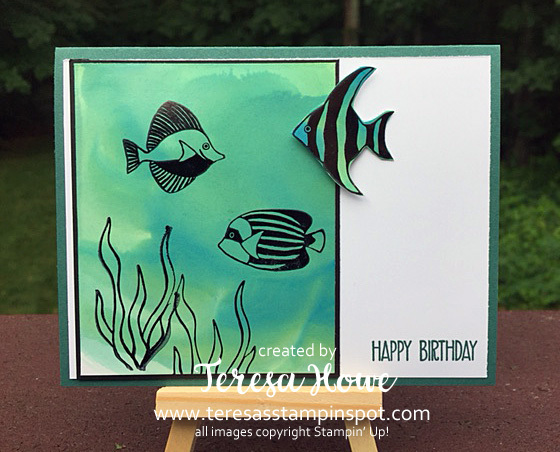 Today I am playing along in the Team Stamp It Summer Blog Hop! School ended on Thursday for my children and we celebrated by heading to the local ice cream shop. 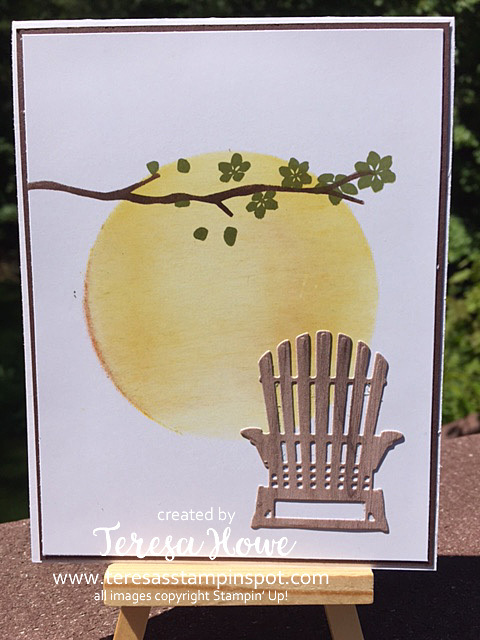 That inspired my card for today – as this represents the start of summer for us. 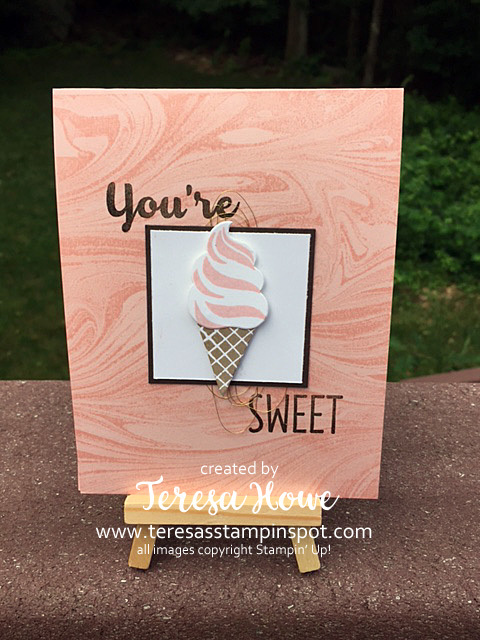 I used the new Marbled background stamp, inked in Powder Pink for the background. The ice cream swirl is also Powder Pink and the cone is Crumb Cake. The sentiment is stamped in Early Espresso. The sentiment and ice cream cone are from the Cool Treats stamp set. I added a bit of Gold Thread behind my main panel and dimensionals on the ice cream cone. Do you have a tradition that kicks off summer for you? Congratulations to our May Hop Winner!! Hi! So excited to let you know that the Daisy Punch is back in stock and I can finally share this card with you! This is one of the cards I made for a swap I did back in May. I was so happy with how it turned out and I love the color combination. The daisy is stamped in Smoky Slate ink and punched out with the coordinating punch. I did two of the daisies to get the full look. The center is colored with the Daffodil Delight marker. After attaching the two daisies together with Liquid Mono Multi and letting it dry, I added glue from the Fine Tip Glue Pen to the center to give it a dimensional look. The sentiment is stamped in Night of Navy to match the Designer Series Paper. A piece of Daffodil Delight stitched ribbon added just the right touch to the card. The Whisper White panel is matted on Basic Black and Daffodil Delight cardstock is used for my base. 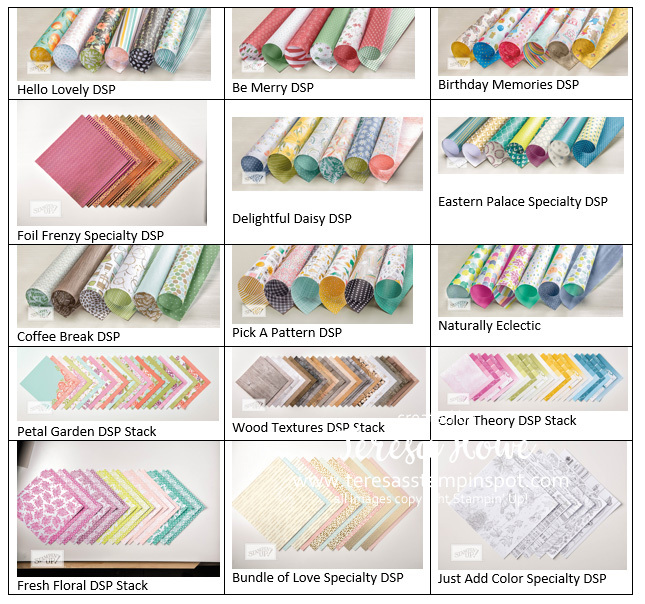 Now – hurry to my store and order your Daisy Delight bundle before the punch sells out again! 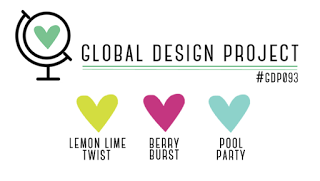 This is such a refreshing bundle to play with – and perfect for summer! The lemons are stamped in Daffodil Delight and punched out with the coordinating punch. The leaves are stamped in Old Olive. 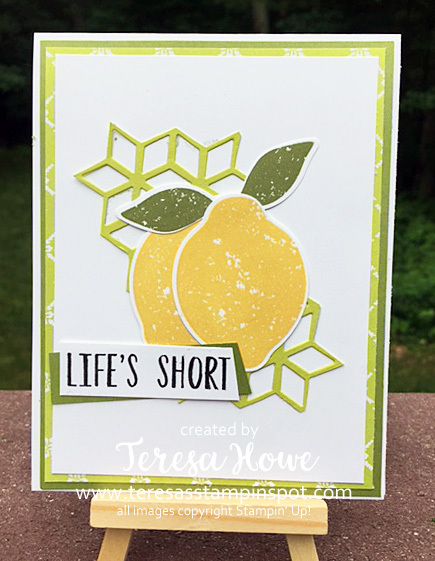 The layer behind the lemons is die-cut using the Eclectic Layers framelits and from the new Lemon-Lime Twist card stock. My sentiment is colored with a Basic Black marker (the actual stamp has the words on two separate lines – but I wanted it to read across to match the layout for the challenge). The Designer Series Paper behind the Lemon panel is from the Fresh Florals Designer Series Paper stack. This is then layered on Old Olive. I used the Thick Whisper White for my base. I didn’t take a picture of the inside (I need to remember to do that) but I did stamp the sentiment Squeeze it for all it’s worth in Basic Black. 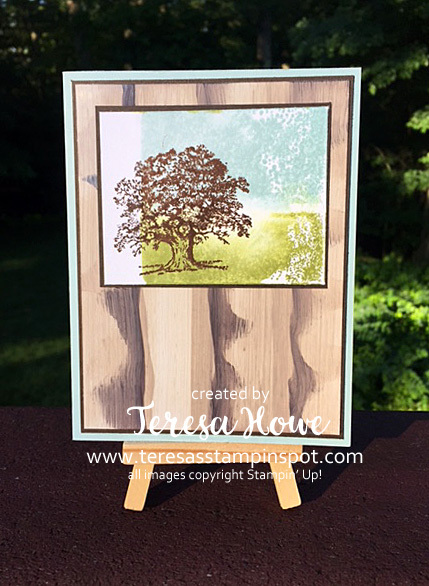 You will find all the products used for this card in my on-line store! There you have it – hope you enjoy the fresh look of today’s card! If you decide to play along with this week’s GDP challenge – please let me know! Hi! Today I have a card featuring our new Glossy Paper! Love how vibrant this looks. I am so excited that we are now carrying Glossy Card Stock again! 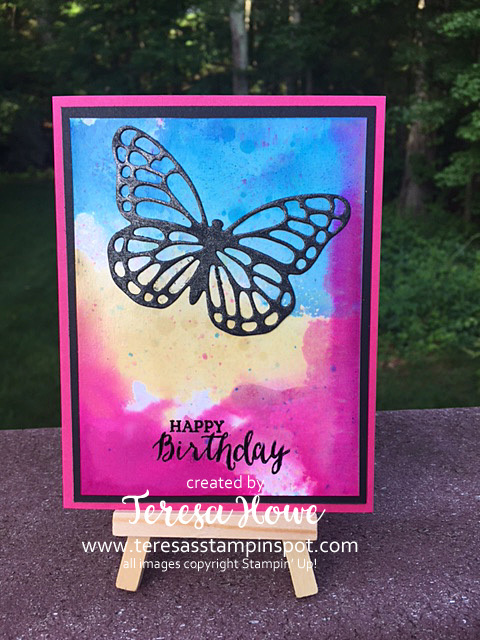 This is a fun, but messy, technique that I will be showing at this month’s Fun with Glossy Card stock class on June 23rd. If you live near Northboro, MA, USA, consider joining me! Do you have a favorite technique you like to use on Glossy Paper? Let me know! Hi! Today is the day!! 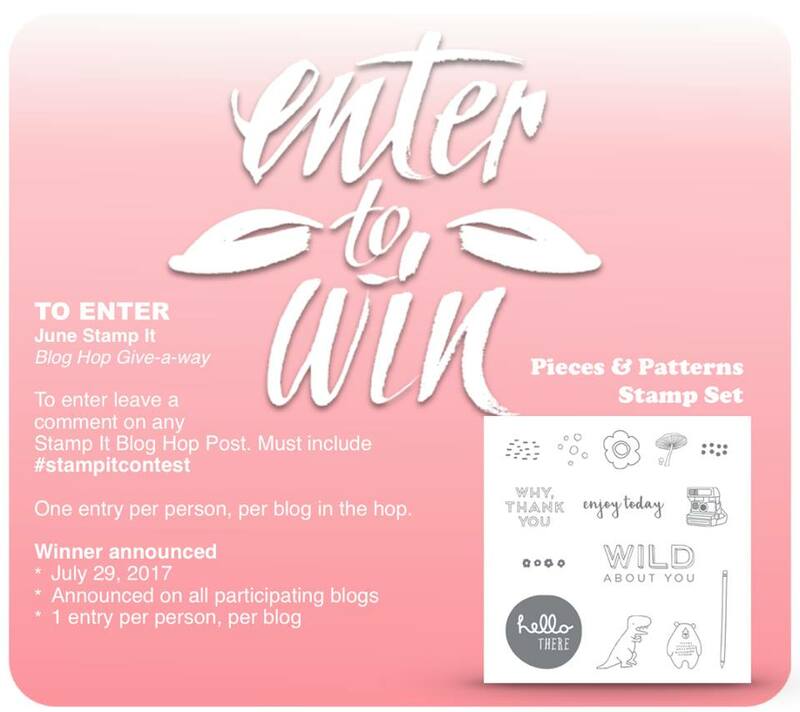 The new Stampin’ Up! Annual Catalog has arrived!! New colors, new products, new stamps, new bundles! If you haven’t seen the catalog yet, you can check it out On-Line by clicking on the Catalog Icon on the right. Today I am sharing my favorite bundle from the entire catalog! The Colorful Seasons bundle. If you get nothing else from the catalog – you NEED this set. It will cover occasions all year long! 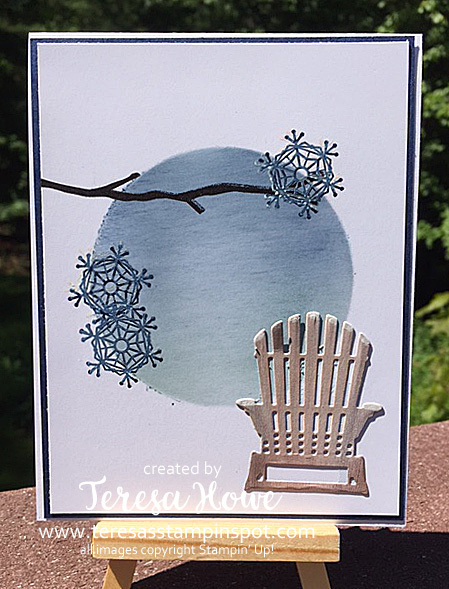 I love this bundle so much, I am making it this month’s Stamp Set of the Month! Order this bundle through my on-line store using this hostess code TXEZYDZS and you will receive a color photo tutorial for at least 4 cards. I have lots of ideas, so it is a good chance the tutorial will contain a few more than that! I love the snow on the chair! 145348 – Colorful Seasons Photopolymer Bundle $54.00 – contains stamp set and coordinating framelits. The tutorial will be emailed out on June 15th. 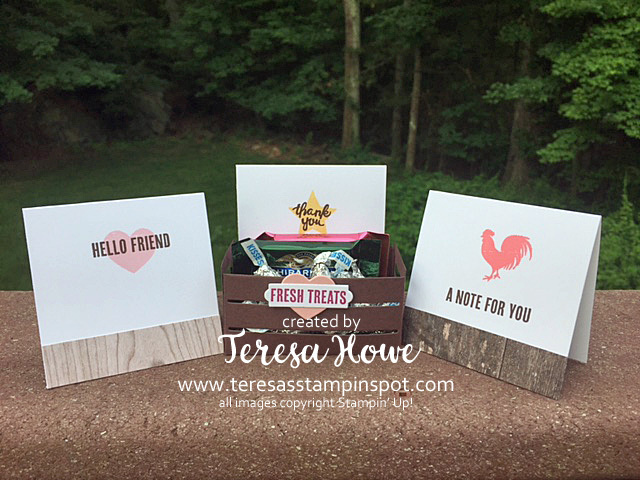 You must use the hostess code when ordering so I know you are participating in the Stamp Set of the Month! Also, when you participate in 5 Stamp Set of the Months, you will earn $25 in FREE merchandise! With the new catalog, I am also offering a few product shares! The first product share is for the new Designer Series Paper! You will receive 129 6×6 sheets!! This is a great way to try all the papers for a great deal! Cost is $35!! Reserve your spot in the Paper and/or Ribbon Shares by emailing me at teresa.howe@verizon.net by June 10th! Shipping is $5 per share. US Customers only! What do you think of the new catalog? What is your MUST have?? Leave a comment below and be entered into a drawing for a pack of the Wood Textures Designer Series Paper Stack! Comment must be posted by June 10th – name will be drawn on June 11th!